The What: CyberTouch has introduced a line of 4K multitouch monitors – the Rio 4K Series. The What Else: The Rio 4K line of multitouch monitors offer high-definition resolution of 3840 x 2160. Allowing up to 32 simultaneous inputs using advanced IR technology, Rio 4K offers a smooth interactive canvas with no ghosting or blind spots, the company says. Rio 4K is currently offered in diagonal sizes of 32”, 55”, 65”, and 84”. 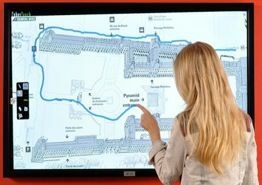 The Where: Ideal for conference rooms, educational facilities, museums exhibits, convention and experience centers, military bases as well as government facilities, Rio 4K is the high definition, cost-effective solution for your interactive needs.